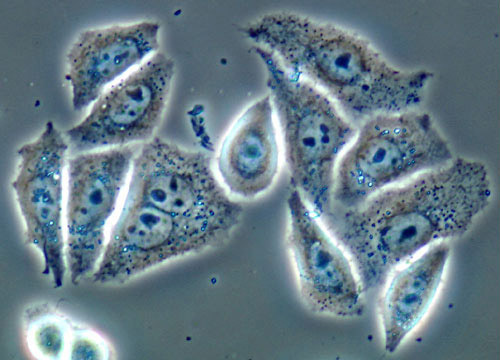 HeLa cells have been cultured continuously for scientific use since they were first taken from the tumor of a woman suffering from cervical cancer in the 1950s. They have been utilized for many purposes, including the development of a polio vaccine, the pursuit of a cure for diseases such as leukemia and cancer, and the study of the cellular effects of drugs and radiation. The woman from which the HeLa cells are derived was named Henrietta Lacks, and she was a wife and mother of five when she passed away at John Hopkins University at the age of thirty-one. A sample of one of her tumors was sent to George and Maragret Gey who had been seeking a line of human cells that would survive indefinitely outside the body for research purposes. The tumor cells they received multiplied like nothing they had ever seen before and soon the cells, dubbed HeLa in a truncated form of Lacks' name, were being shipped to their colleagues stationed around the world. The cells later became a laboratory standard and have even been grown in space. Interestingly, the aggressive nature of HeLa cells in culture led not only to scientific discoveries, but also to experimental mistakes. 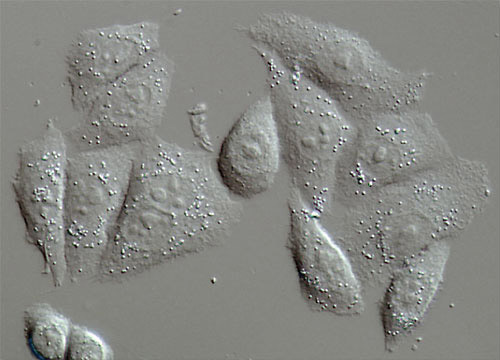 HeLa cells can easily invade other cultures during routine lab transfer procedures and had contaminated many other cell lines used in research by the late 1960s. As a result, numerous research papers that were published based on a variety of cultured cell types have subsequently been proven to be HeLa cells and have, therefore, been discounted.